Baby E is a shoe addict, she just doesn't know it yet. She likes to try on different shoes. I try to have one or two good pairs of shoes for her to wear each season. That's better than having five uncomfortable cheap pairs. I couldn't really find anything good for her to wear at home though. Since our house sits on a concrete slab, we have very cold floors. Winter is fast approaching and a pair of socks simply won't do anymore. This is where Scooterbees comes in. 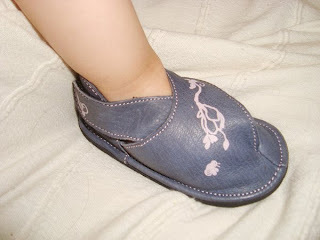 Simple shoes that are perfect for infants and toddlers to wear both indoors and out. Thanks Scooterbees for sending us two pairs to try. Ease of use: Have you ever had to struggle with putting on a pair of shoes on a baby? It's not fun. We love the ingenious design of the Scooterbees. They're easy on and off. What else can a parent ask for? Quality & Value: These shoes are handmade in Peru and are of very high quality. The leather shoes are around $34-$40 a pair and the original ones are anywhere from $20 to $38. I think that's a little pricey, but at least everyone gets fair wage in the process and the shoes are not made by child laborers from who knows where. How is this green: For every pair of Scooterbees purchased, Trees for the Future will plant a tree. There is no lead or phthalates in any of the components. ScooterBees are made of recycled fibers dervied from both post-industrial and post-consumer sources, including PET soda and water bottles. The little soles are made with the anti-slipping and water-resistant ThermoPlastic Elastomer (TPE) material. TPE is a degradable material made of carbon and hydrogen, it uses no harmful chemicals in its production such as in traditional PVC’s . It is PVC-free, latex-free, and most-importantly, chloride-free, dioxin-free, and phthalate-free. The leather ones are 100% Vegetable and Fruit tanned leather with no harmful chemicals. Fit & Design: We have tried both the cloth and the leather version of Scooterbees. For the way it fit my daughter's foot, we preferred the cloth. The leather ones just didn't seem to fit quite right, although they look like they're the right size, I think they are just too small. Nevertheless she does wear the leather ones around the house comfortably even though they don't look like they wrap the foot quite right. These are great for infants both indoors and out, but my active walking toddler can't really wear these outside here in New England. They're perfect indoors in our climate. We love the story-telling part too. My toddler doesn't really have enough patience to listen to me tell the whole story, but she does like pointing out all the things she sees drawn on the shoe as I am putting them on. Who Would You Recommend this to? Infants and pre-walkers, early walkers and toddlers indoors, or early walkers outdoors in dry climates with moderate weather. For parents who get frustrated with baby shoes that are hard to put on and/or leave marks on baby's feet. Buy ScooterBees at the Eco-Babyz Boutique. One Eco-Babyz reader will win a pair of ScooterBees for their little one! MANDATORY ENTRY: Visit the ScooterBees website and tell us which pair you prefer and if you win what size you would need. Contest ends at 11:59pm EST on Wednesday, September 8th. The winner will be selected using Random.org on Thursday, September 9th and notified by email (make sure I have a way to get in touch with you, provide email in your comment if it is not in your Blogger profile). Open to 18+ US residents! Thank you! I would choose the ScooterBees Infant/Toddler Growing Bird Crib Shoe in a size 5! My lil one has such Wide Feet!! Follow you via google friend connect! It didnt give me a confimation though how do i know it went through? I love the ones with the elephant, and I would need size 0-6 months. I like the pink shoes size 5. I would love the Endangered Animal Crib Shoes in 6-12 months! Wrote on your FB wall! My favorite are the turquoise with pink flowers, and I would need size 3.5. Thanks for the giveaway! I would choose the turquoise with pink design in 6-12m. Thanks! I like the endangered animals ones in size 6 months. I would choose the 4 Seasons in 4 Seasons in Pink leather in size 2 year. I love the little ones with the Panda Bear on the front and the extra piece of fabric that folds over on top of it. I would need a size 2. I really like the ScooterBees Infant/Toddler Caterpillar Crib shoe and I would need them in 0-6 Months. 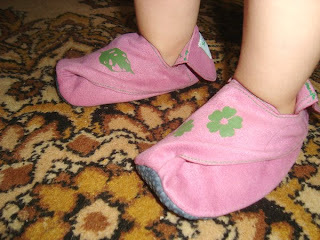 I would love the turquoise slippers with pink design in 0-6 months size. LIKE EB on Facebook. Left a message on your wall. For a friend I'd like the green fabric elephant shoes in 12-18 months. I like the turquiosew/ lavender flowers size 12-18 month! 1. I subscribe to eco-babyz emails. I subscribe to eco-babyz emails. I follow eco-babyz with gfc.